We’ve just released our annual industry trends forecast, Skift Restaurant Megatrends 2019. You can read about each of the trends on Skift Table as well as download a copy of our magazine here. Restaurant-supporting startups and established brands alike have taken this to heart by utilizing micro-feedback, bits of information frequently collected throughout a customer’s interaction with a product, service, or experience that tend to be more specific and actionable than those captured on a macro level. Take OpenTable, a relative dinosaur in the reservation platform space whose commitment to customer satisfaction has helped to prevent its extinction. The company first began offering online reservations 19 years ago exclusively in San Francisco; now, it works with 47,000 restaurants globally. It’s needed to evolve, not only as a means of keeping up with technology, but to continue to compete with more recently established brands providing a similar service. Accordingly, user feedback is more important than ever. The company redesigned its app earlier this year in response to users seeking more immediate reservations through the platform. Factoring in user research and both diner and employee feedback, the interface now presents two choices: “book” for those wanting to eat sooner rather than later, and “discover” for those looking to browse. Each option takes the current time of day into account to suggest the most appropriate meal. The platform also recently made it possible for diners to select their preferred seating option, whether that’s at the bar or on the patio. And in October, OpenTable introduced GuestCenter, a means of streamlining operations and increasing bookings across restaurant groups to make it easier to offer alternatives when the exact time and location originally requested by a guest aren’t available. Resy launched in New York in 2014, and hit the ground running. Its network isn’t as large as OpenTable’s (yet, anyway), as it currently works with about 10,000 restaurants, but it understand what its users want just as well, if not better. In April of this year, Resy announced its integration with Upserve, an all-in-one restaurant management platform that provides “granular insights into guest preferences — from favorite dishes and dining companions to frequency of booking — to make everyone feel like a regular,” as explained on the Resy blog. They also introduced Resy surveys soon after, “to optimize and enhance the dining journey for customers.” The reservation-integrated product “allows restaurants to completely customize private post-meal surveys to gain insight into all aspects of their operation — from steps of service, to customer behavior, to seating and meal preferences. Every survey is tied to a reservation, supplying the restaurant with meaningful, useful and actionable insights from the customer.” And, to address a customers’ desire for instant gratification in a different way than OpenTable, Resy also allows diners to book tables directly through both participating restaurants’ Instagram profiles, and Google. Consumer micro-feedback has influenced third-party delivery services, too. To address the desires of diners who wanted a no-fee option, DoorDash began offering in-person order pickup in August. Uber Eats modified its delivery fees that same month, replacing the previously flat fee with a pricing tool that calculates costs based on customers’ proximity to the restaurants they order from. And when Grubhub closed its acquisition of LevelUp in September, Grubhub founder and CEO Matt Maloney explained it was with the intention of helping “restaurants actively engage with their diners,” surely recognizing the value in doing so. When customers’ needs are part of product development, all associated parties have the potential to better achieve desired outcomes. Skift Table contributor Ally Spier is a Brooklyn-based writer and designer who studied ergonomics at Cornell, and architecture at Pratt. Her background in design informs her love of food and travel… and vice versa. Google Maps has become a daily must-use for plenty of people. 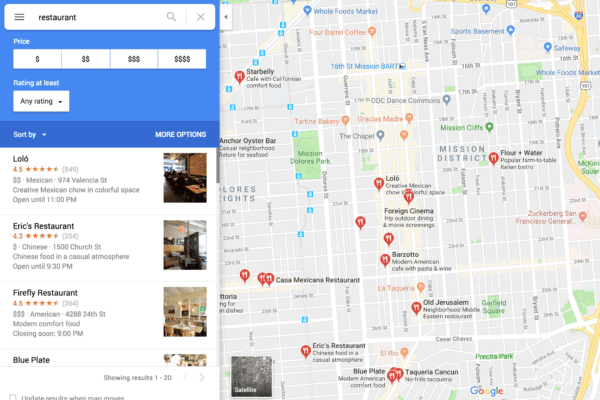 As its parent company looks further into the restaurant business, Maps could become an indispensable superapp for the future of restaurants. Uber Eats and Grubhub have both publicly cited losses on discounted fees charged to chain partners in financial documents. One can only imagine the case is the same for DoorDash, who's IPO is likely not far behind. Uber Eats has proven that it has the runway to generate a significant portion of Uber's overall revenue, but food delivery is a volatile business. The service may be winning big contracts with McDonald's and Starbucks, but that isn't necessarily translating into more profits.